Google has a problem. Google’s problem is that for all their variety of products, their only revenue stream of consequence is advertising. And for all of the fancy ideas and products they throw at the market, it appears that unless they can take back the mobile handset market with their Motorola purchase (which they do not appear to be positioning themselves to do), advertising is going to be the primary revenue stream for Google for a long time to come. Google has a business model problem, and the cornerstone of this problem is the fact that while Google is in the advertising market, it has outgrown the market. In the early years, their growth was fueled by the rapid growth in electronic commerce, and the fact that traditional advertising was not able to drive electronic commerce. Since then the market has stabilized and Google is the established leader in electronic advertising, with the traditional channels still maintaining print, outdoor, television and other media channels. If it can be reasonably assumed that the largest growth in electronic commerce is behind us and that the current landscape will be increasingly more mobile where Google has lower market share, Google has limited potential for continued growth in advertising. 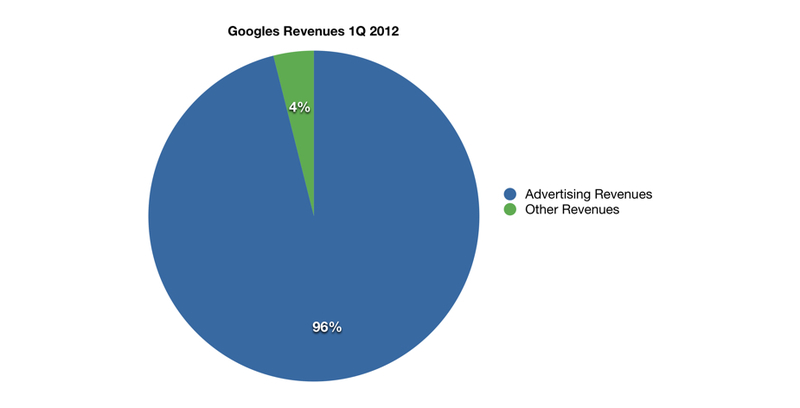 Google’s revenue is almost entirely in advertising, and they don’t appear to be branching out any time soon. For all its searching (and finding) adjacent markets, it appears they only make halfhearted attempts at monetizing these markets. Take for example the ability to perform mathematics and graphing functions through their search engine. Before Google entered, WolframAlpha provided this capability through free trials followed by premium memberships which have additional flexibility and capabilities. However, Google appears to have entered only for the purpose of limiting the revenue potential of a minor competitor, if WolframAlpha can even be called this. Meanwhile, Apple and Amazon have established themselves with business models that, while very different from Google, flank and de-position the Google business model. Apple has built a successful model of obtaining revenue from software, hardware, services, as well as content which Google has not been able to replicate quickly enough. Not only this, but Apple has clearly been moving away from Google in all elements of their operations, recently even taking Google Maps from their mobile devices – clearly in an effort to eliminate the potential for advertising revenue through popular Apple devices. Likewise, Amazon has built a successful model entirely based on selling products and online content; if Amazon is the premier internet source for products and content, they also control the advertising of the content and Google is again left out of the picture. Google needs a 2.0 strategy in order to continue their growth. This strategy must appreciate, but not limit itself to their advertising market strengths. This strategy must not simply copy the strategy of Apple, but must provide differentiated value in order to become a significant source of revenue.